When you are having guests for dinner the last thing you want is to be tied to your stove, right? Over the holidays my cousin and I got together to cook for our family, and we came up with a menu that would allow us to prep and cook ahead of time while having a few drinks and catching up. And then when everyone arrived we had a few things left to do in the kitchen, but most of the meal was already prepared. 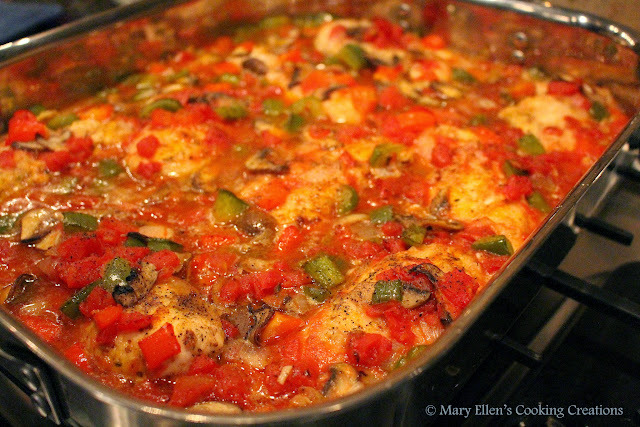 The oven braised chicken cacciatore was a new creation based on a recipe I have previously used for a quicker stove-top cacciatore and my desire to make a meal completely in the oven. We basically seared the chicken, cooked the veggies down a bit, and then transferred everything to a roasting pan to braise. Super easy, right? And the aromas you get while this is cooking away in the oven will make your guests so hungry for dinner. 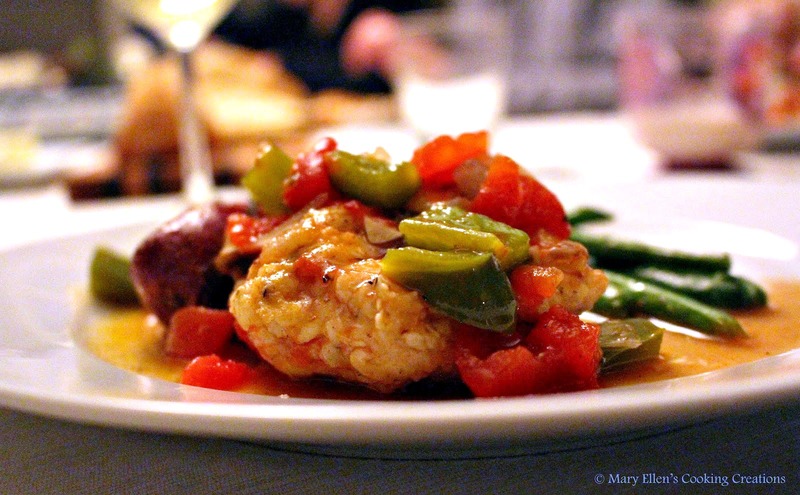 This chicken was tender and juicy - the perfect result of braising. But the star of the dish was the sauce, one of the most delicious things I have made - seriously. It's basically a tomato broth, but when combined with the wine and herbs and veggies it turns into a rich and comforting sauce and you won't be able to get enough of it. Every single person was sopping it up with the bread after dinner and some of us even went back for more sauce and bread. Put this one on your list for your next dinner party, or Sunday dinner, or snowy day meal, a rainy day meal, the first chilly day of the year, the last chilly day of the year, when you are craving chicken, when you have a loaf of bread that is dying to be dipped in sauce, a weeknight when you have just a little extra time... get the picture? No reason needed, just make this one. I promise you won't be disappointed. Spices and herbs to season your chicken: salt, pepper, dried thyme, dried oregano, garlic powder, onion powder, paprika. Be generous. Season your chicken generously with the salt, pepper, and herbs. Coat with flour. Heat half of the oil and half of the butter in a large sauté pan. Shake excess flour off the chicken and add to the pan (cook only 3-4 at a time so as to not crowd the chicken in the pan). Cook 3-4 minutes per side until you have a nice, golden sear. Transfer to a large roasting pan. Repeat with the remaining chicken. If your pan is dry, add a touch of oil. Add the peppers, onions and mushrooms to your pan. Saute 3-4 minutes. Pour the tomato mixture over the chicken, and then add the broth slowly until your chicken is almost completely covered. Season with salt, pepper, and thyme.